The Designing Buildings Wiki, pictured below and explained above, is a wiki for the construction industry. It is active - with 5 million users, 14 million page views per year, and plenty of new edits and content added in the last few days. It's 7500 articles cover topics such as project planning, project activities, legislation and standards and industry context, It also contains overviews of iconic buildings such as Number 10 Downing Street, the White House, the Palm Atlantis and the Bank of China Tower. 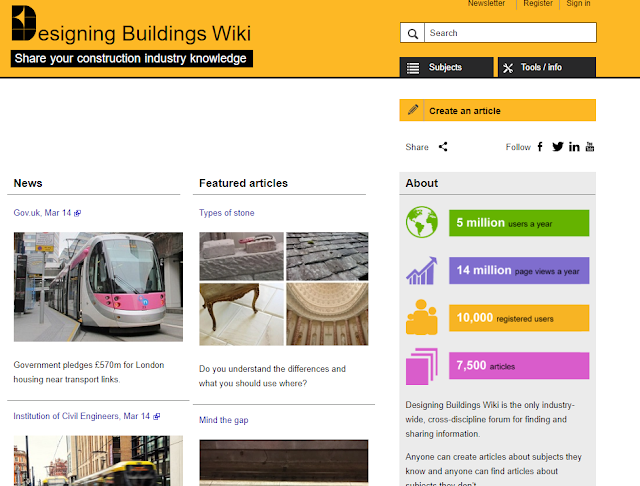 It looks like it uses MediaWiki technology, and is edited by Designing Buildings limited. It has useful features such as a "related articles" box, and a "featured articles" section. It even contains a section on Knowledge Management in construction.